As today is my birthday (49th), I thought I might be allowed a bit of self indulgence. This blog of course explores my interest, but I rarely feel it is suitable or appropriate to publish images of my own work, today will be an exception. I will , as usual include images created by far greater masters then this humble author; to provide examples of inspiration, and sadly reveal the weakness of my own compositions. With this in mind , please view my attempts as the scribbles of an enthusiastic amateur. 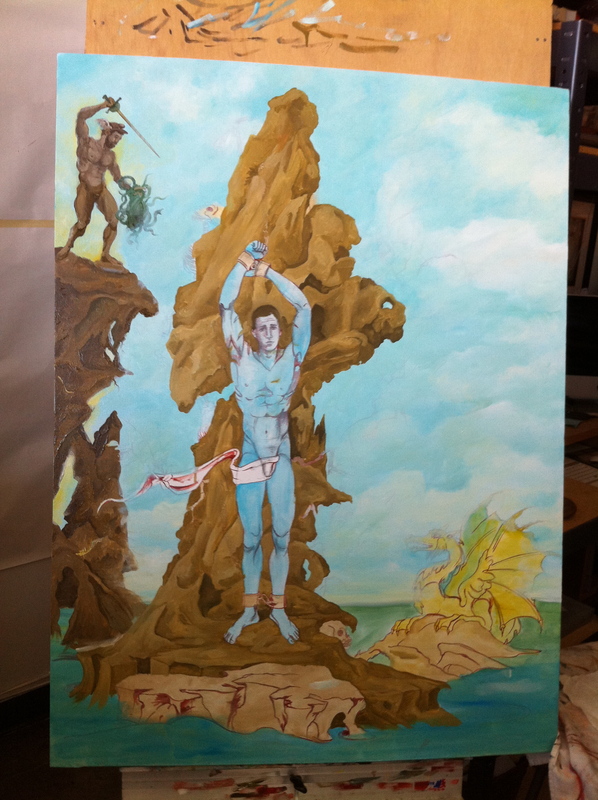 Since boyhood Greek mythology has captured my imagination, the tale of valiant Perseus rescuing fair Andromeda a particular favorite. Psychologically I haven’t a clue as to why this myth resonated so viscerally; am I Andromeda? am I Perseus? I imagine I am a hybrid of both. 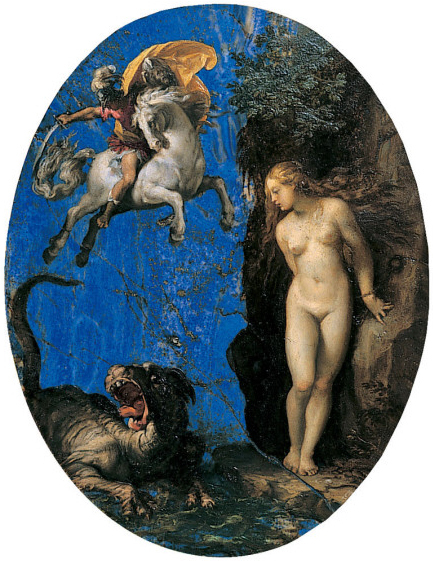 I recently stumbled upon an example of the myth by Giorio Vasari, this painting rekindled my delight in the tale and inspired me to attempt my own version. 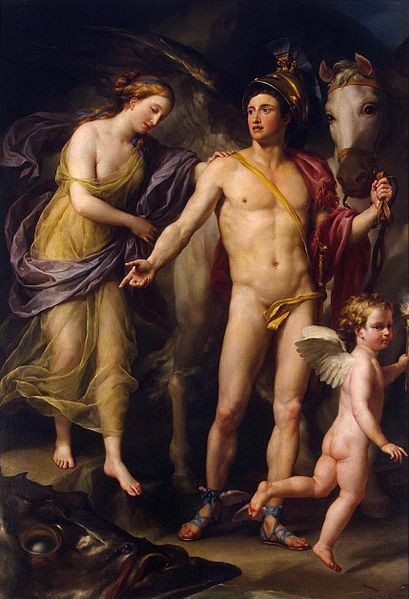 I desired to portray the story as closely as Vasari had, but to switch the lovely maidenAndromeda with an equally lovely boy, Andromedus -if I mangled the Latin, pardon me, my last Latin class was in 1980. What I find of particular interest is that in this painting , part of a decorative scheme depicting the elements, this being water, Vasari is not only imaging the voluptuous moment of valiant rescue, but also depicting the moment in which coral is first created. 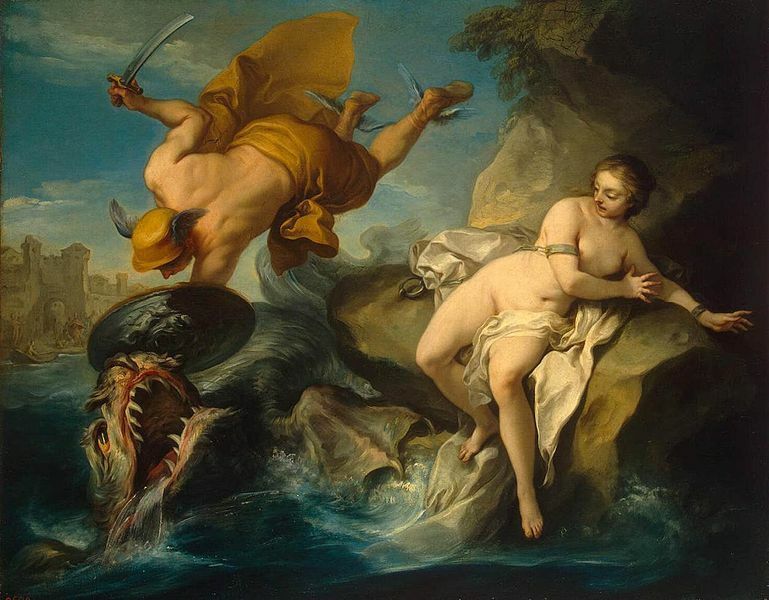 Popular legend imagined coral to be the result of the spilt blood of the gorgon Medusa. I love that, I have a bit of coral around my neck, I am tickled that it is a relic of the fearsome Medusa. My composition sketch is more modest, and I fear perhaps more “gay”, I probably should examine why that is bothersome to me. 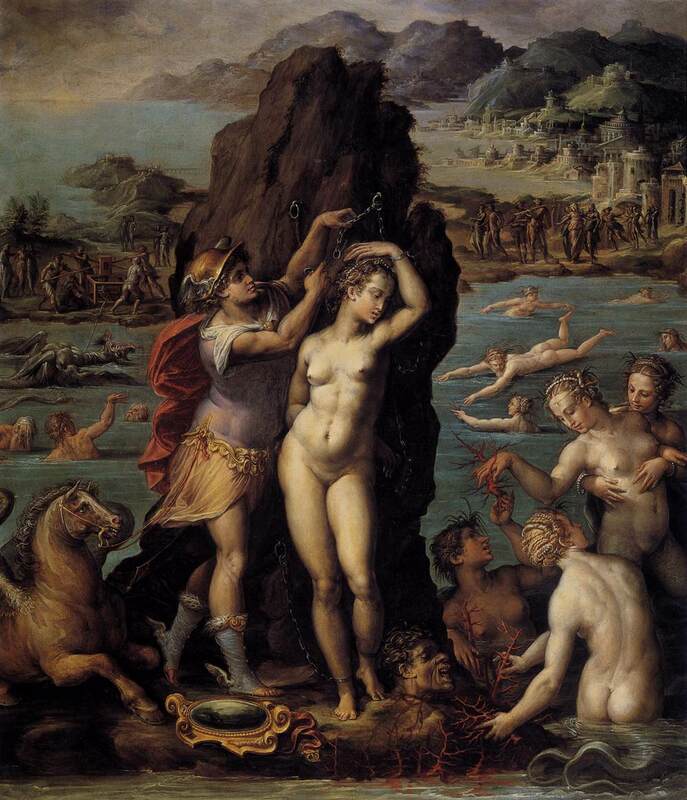 Vasari very clearly relished depicting the seductive Nereids in their aquatic Sapphic play. 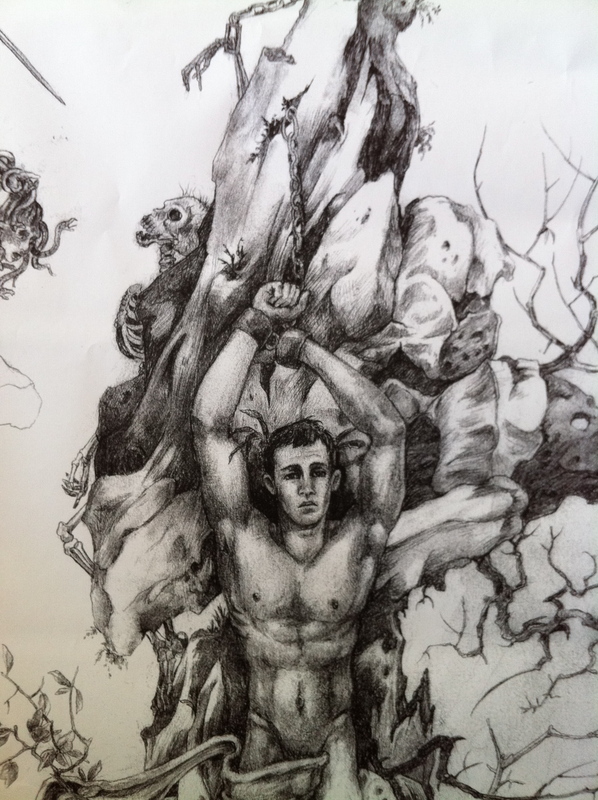 Why should I hesitate to depict vulnerable male pulchritude? Ovid describes Andromeda , bound and helpless, as frozen like a “marble statue”; I wanted to capture that sense with my youth, resigned to his fate. This is the moment prior to his salvation Perseus approaching from behind, Vasari depicts the scene post rescue, the monster quite slain. I admire how Vasari managed to balance his sensual delight in the figures and still create a poetic composition. 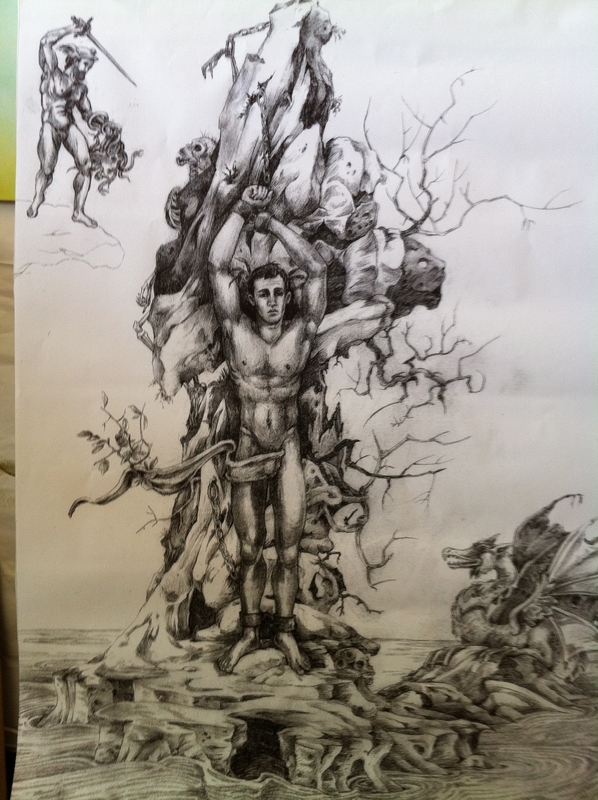 what I fear is my composition will take on the lascivious qualities of illustrators such as Boris Vallejo. I hope that with a thoughtful palette, I will be able to avoid the excesses so often depicted in what is categorized as gay art. I hope this isn’t some bit of repressed internal homophobia, but in actuality an attempt to fuse sensuality with beauty. The Humanist painters were so successful at that. As usual I will conclude with some really marvelous examples of this fusion of beauty, physical and soulful. They of course provide inspiration and intimidate the hell out of me. I must carry on nonetheless. 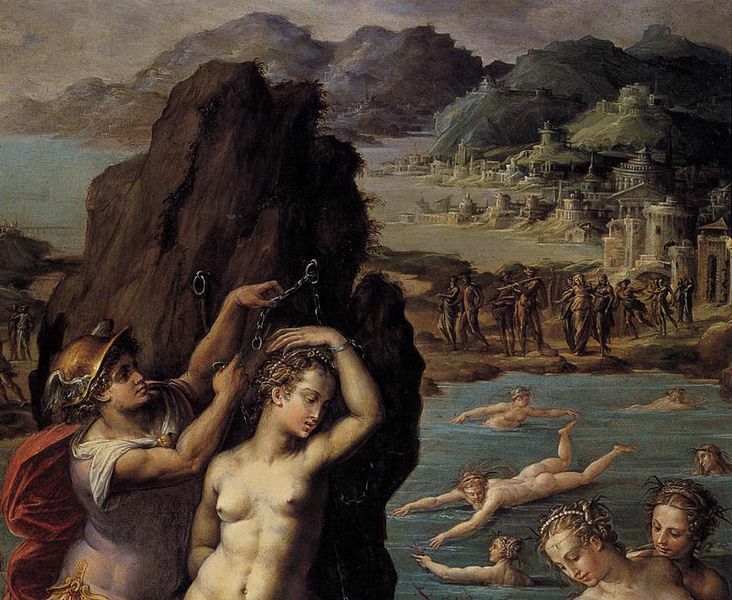 Annibale’s brother, Domenichino ,might have been responsible for the depiction of Andromeda’s wailing parents Cepheus and Cassiopeia. I particularly love the sea monster. 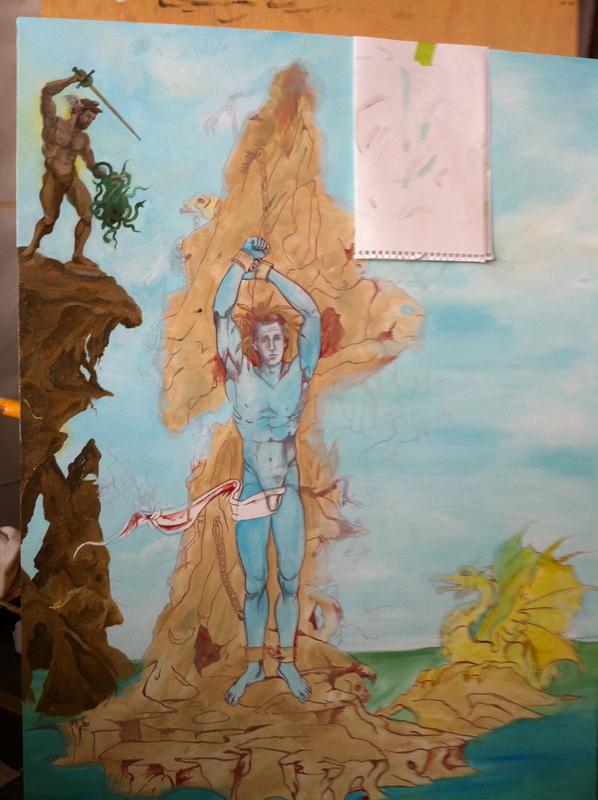 I chose to depict my own Leviathan dragon- like, but I may change that as the painting progresses. Another marvelous example is painted on lapis lazuli, such opulence! 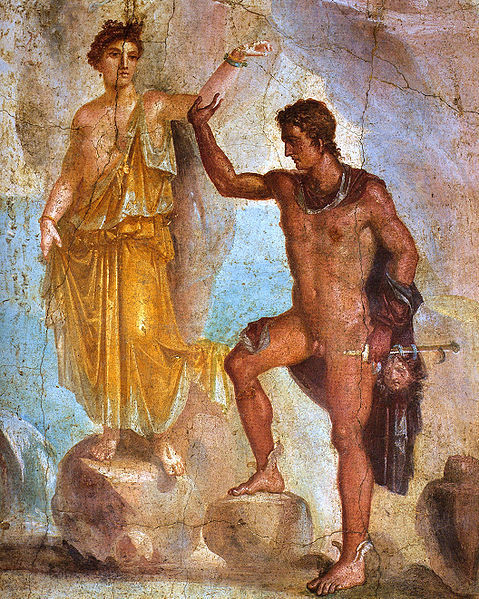 The next image, from Pompeii, is perhaps a bit closer to the source of the tale. 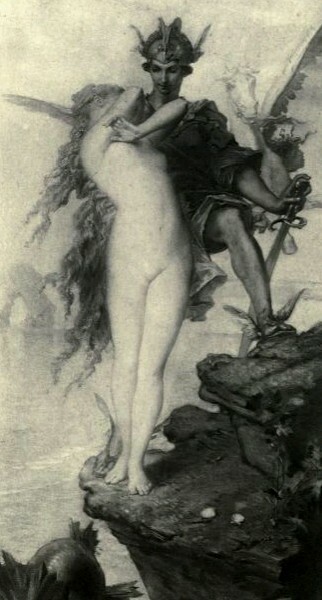 The following example, though more chaste, is perhaps a more charming depiction of the rescue. The following 18th century example really capture the fleshiness of the tale, a visual delight. Again, enchanted by the Sea Monster, I really will have to re-work my version. 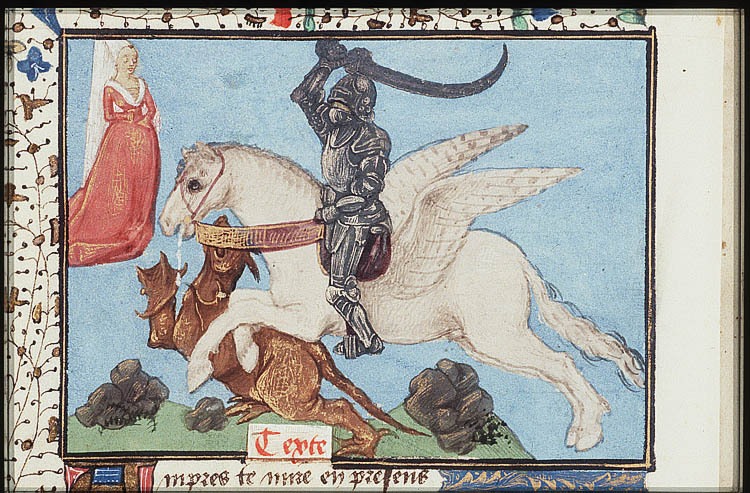 This smoking hot Perseus is soon to be replaced in the 19th century by images almost as chaste as the 15th century illumination. Alas the artist’s skill level is probably more in line with my own. 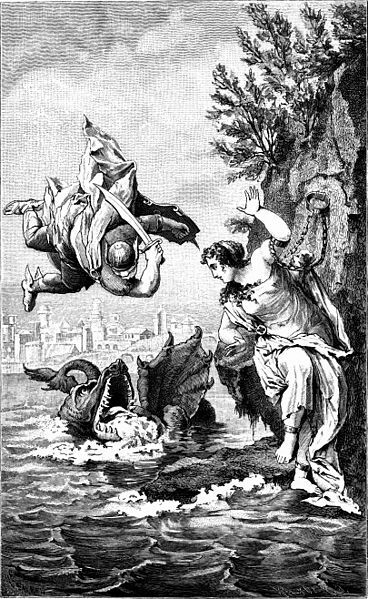 Illustration of the tale by Gustav Benjamin Schwab ( 1792-1850). 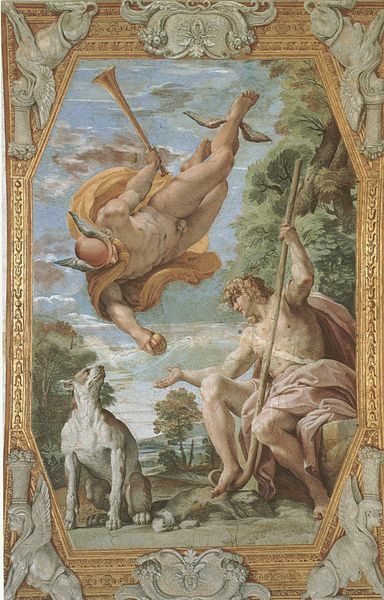 Schwab’s depiction of Perseus is lifted almost directly from Carracci’s imagining of Mercury in the Farnese panel Paris and Mercury, although as mentioned without the nasty bits. A more poetic image from a Frenchman is perhaps to be expected. 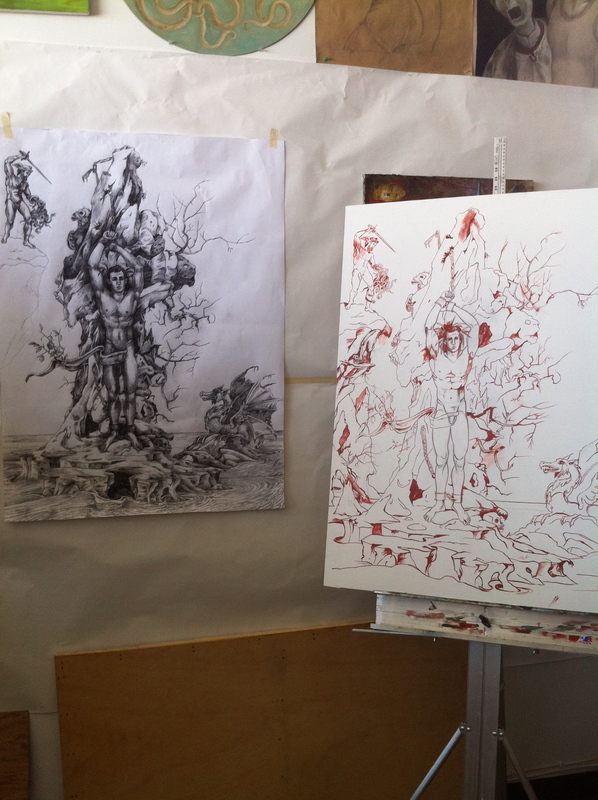 I will begin the painting shortly, it is a daunting task, but one that I look forward to. I will periodically keep my readers abreast on its progress. 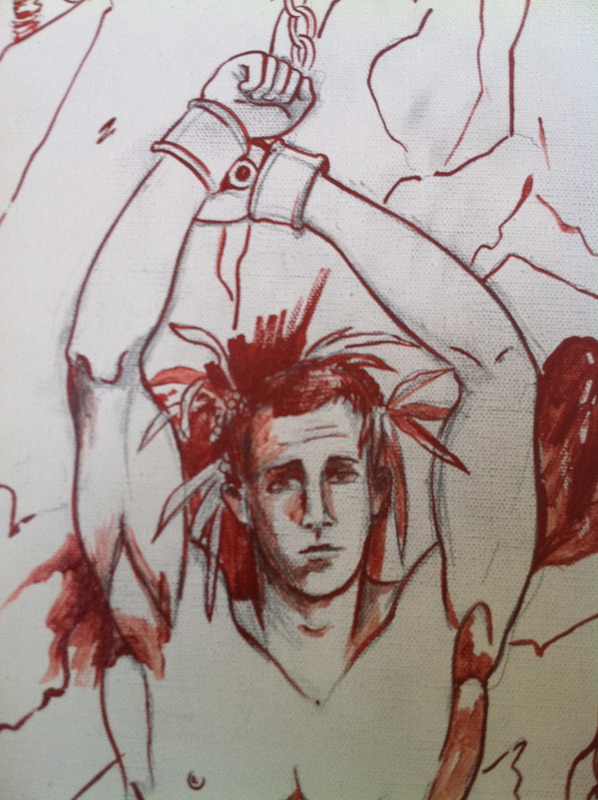 Slow going on the painting, but here is the progress thus far. 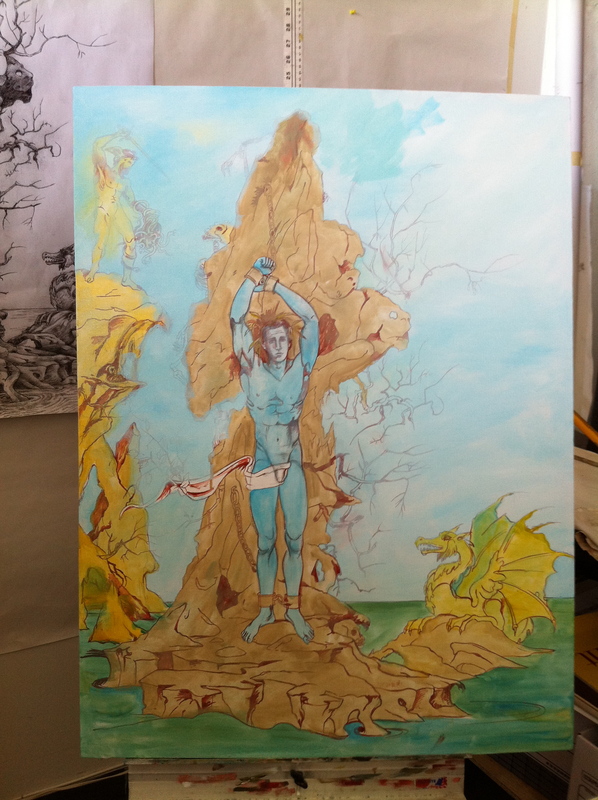 August 14th, I have continued to work on Perseus for much of the day.